Can Azulstar Make WiMax Work without Buying Spectrum? Azulstar once pinned its fortunes on city-wide Wi-Fi, but now looks to a special licensed spectrum band to make WiMax work where Wi-Fi failed: Azulstar has been the also-ran in Wi-Fi for some years, I'll just state bluntly and upfront. They built a network in Grand Haven, Mich., in 2003 that's one of--if not the--longest running metro-scale Wi-Fi networks in the world designed for public access. The mayor of Grand Haven since 2003, Roger Bergman, told me, "I got on board personally right away, and I am still on." Azulstar soon answered several RFPs and partnered up with major firms to bring Wi-Fi to Rio Rancho, N.M., Winston-Salem, N.C., Sacramento, Calif., and most notably Silicon Valley--a set of dozens of cities along with county government and private enterprise all wanting some kind of tiered Wi-Fi across 1,500 sq mi. Rio Rancho was perhaps one of the biggest letdowns. City manager Jim Payne explained in an interview a few weeks ago, "They had a number of things that were going against them from the start, and they did make an attempt to meet the requirements of the contract." But Rio Rancho voted to not just terminate the contract after years of attempts to make the network work, but rejected a proposal from Azulstar a few weeks ago to switch over equipment on the poles. Azulstar now has to remove all its devices. All of this might make the typical company head a bit depressed about his firm's future, and less than sanguine about the potential for wireless broadband to work at all. Not so for Tyler van Houwelingen, Azulstar's chief, and I have to admit that he convinced me that the wireless provider has a fighting chance, due to a good combination of timing, spectrum policy, and a large dollop of can-do spirit. A couple months ago, Azulstar's PR firm contacted me to get me interested in the company's move from city-wide Wi-Fi, usually created in a public/private partnership, to licensed WiMax, which would be built largely without any city or municipal involvement. I sent some snarky email back, wondering how the track record of Azulstar in their various projects might bode for this new move. Van Houwelingen stepped up to the plate, and gave me contacts at every project they were working on, and I spoke to many of them. Rather than seeing Azulstar as less than capable at executing, I now see them as being a bit of the goat or, as my ancestors would say, the shlimazel: the person in the wrong place at the wrong time who gets soup dumped on him. (As Leo Rosen wrote, the shlemiel trips and spills his soup; the shlimazel is the guy he spills it on.) The picture has changed, though, and they could turn into an avatar for a new way of offering competitive wireless broadband service with enormously fewer of the pitfalls of Wi-Fi. That's part of why I'm rather intrigued about their plan, which I don't mean to be coy about; they certainly aren't. Azulstar will be using the 3.65 GHz band to deploy WiMax. This is a licensed-for-all-comers band under extremely special FCC rules. Any entity can obtain a license for a nominal fee. All parties must register the location of fixed base stations. After that, you're on your own. All users of the band must work together in whatever fashion they choose in a geographical area to avoid interference. This band allows orders of magnitude less equipment to be deployed due to higher power limits than 2.4 GHz and 5 GHz, and thus reduces the reliance on those darned utility poles, which seem to sink so many city Wi-Fi projects. "But this [band arrangement] is really good and it's much better than any Wi-Fi type scenario, so from the world we're working from, we just deal with interference and plan our networks accordingly," van Houwelingen said. That's awfully optimistic from an already surprisingly sunny firm. I consulted Harold Feld, the senior vice president of the Media Access Project, who is one of the people who persuaded the FCC to adopt the licensing terms that wound up covering the 50 MHz of spectrum in 3.65 GHz. "All users have an equal obligation to work with each other, and, says the FCC, 'We're leaving it up to you hard-core libretarians,'" Feld said. That's just fine with van Houwelingen, who knows how much those smaller markets are desparate for better coverage. "We're going after all the big Tier 2 markets around Michigan and New Mexico," he said. Feld noted, "You can make a nice living in there. As an entrepreneurial opportunity, especially with so much of the existing spectrum occupied by the incumbents and well-settled equipment vendors," this is where a firm can build a customer base. Van Houwelingen particularly likes both WiMax and this band, because the combination of the new technology--with equipment available from both Redline and Airspan--and the high power limits of the band allow him to put a single base station in place to cover an area that might have required several dozen Wi-Fi base stations. "The reason muni Wi-Fi was all about public/private partnership," he said, was all about right of way. 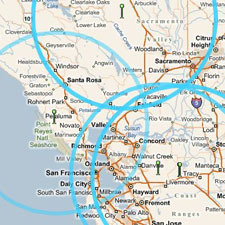 But with WiMax, he can put in "a couple per city--it's quite astounding. And on top of all that it's faster and it works better." This isn't just van Houwelingen's opinion; early WiMax deployments and pilot projects indicate that from several to dozens of square miles can be covered by a single high-powered base station. The real issue is subdividing coverage for both overlapping cells and necessary customer throughput. Azulstar cycled through a few equipment vendors for its Wi-Fi technology, and ultimately used a combination of Tropos and Cisco gear that would deliver "a couple meg" (Mbps), which van Houwelingen felt required a huge investment for that speed. WiMax requires much less real-estate negotiation for placement, and much less fiddling. It also assumes from day 1 that all users will have to purchase a CPE (customer premises equipment) modem to receive the signal, so there's no dispute over whether a laptop can pick up the network or not. Azulstar is still pursuing Wi-Fi for specific municipal projects, but not for public access. A WiMax CPE of the type that Azulstar has chosen to standardize on initially costs about $400 for an outdoor unit and $200 or so for an indoor unit. (They list a model for $500 plus $25 shipping on their site for outdoor reception.) But van Houwelingen expects prices to drop rapidly to $100 as real gear rolls out, and to zero when it's built into laptops like the Centrino line from Intel. His band of choice, 3.65 GHz, isn't part of the formal WiMax profiles, but it's close enough to the more popular 3.5 GHz band used in Europe that manufacturers who want to make gear for the band in the U.S. have few hurdles to hop. Although pricing isn't firm yet, van Houwelingen expects to offer 2 Mbps downstream home service for about $30 per month up to 20 Mbps service with true service level agreements for 99.995 percent availability for a couple thousand dollars a month. In the markets he plans to cover, these are likely highly competitive rates compared to wired broadband, coupled with the flexibility and speed of getting an installation in the coverage area. The 3.65 GHz band isn't without challenges. Harold Feld said this is the first time the FCC has adopted rules like this, and it's a grand experiment. If a bad actor decides to mess with your broadcasts and won't engage in negotiation, "The only right you have under the rules is to go to the FCC is to say he won't even pick up his phone," Feld said. But that's still better protection in some ways than what's available today in unlicensed band. Feld notes that if someone is truly unreasonable, you could point your antennas at his or her, and "he's going to have to be reasonable, too." Even though this has the potential to result in a Tragedy of the Commons, Feld disputes concept, because the commons worked historically quite terrifically for hundreds of years. It was only until the enclosure movement that privatized in the hands of lords land that was formerly collectively held, he notes, that problems arose--sound a little familiar in spectrum terms? But Feld notes that deliberately malicious acts are actually already illegal, and the FCC could prosecute under those laws. And if the band rules don't work, the FCC could just come back in and reclaim the band, rescinding the licenses. In practice, van Houwelingen expects that by being a first-mover in many markets, that he will have the equivalent of some incumbent rights. He'll have staked some territory out. "If you can move in a market quickly, which we are doing lighting fast" you can establish a beachhead, he said. Feld doesn't precisely agree, but he also thinks it's a reasonable strategy. "Being first in means you're going to be on the ground, and you're going to take part in the negotiations," Feld said. "You're shaping the situation as it evolves rather than having to live with a situation in which the first guy is there, and the second guy comes in, and says we need to" work it out. But Feld warns, "There's going to be an obligation on them to accommodate new entrants and on anyone else who comes in to accommodate new entrants." Beyond the spectrum issue, WiMax should help Azulstar solve some problems that dogged them in their two best-known deployments in Grand Haven and Rio Rancho. Grand Haven's mayor Bergman, a fan of van Houwelingen and the network, noted that his city has a lot of sand dunes, "and it's difficult for them to get some of their signals with Wi-Fi--they had a tough time getting it into some of these areas." WiMax receivers can be put much higher off the ground, and require indoor or outdoor receivers will make it more likely that a marginal signal, already at much higher power than Wi-Fi, can be well received. "There won't be these dead zones that we're running into in the city because the type of topography of our city," Bergman noted. In Rio Rancho, city manager Payne was quite sympathetic to Azulstar's position. "We're about 100 sq mi of scattered development within the city, probably about 30 percent developed within the area," which made it hard to locate nodes efficiently. Added to that is the stucco construction of many homes: "It's basically plaster that is applied over a frame of wood and chicken wire," Payne explained. Chicken wire frames produce the equivalent of a Faraday Cage that blocks or degrades radio waves. "That's one of the problems that they met in terms of trying to make inroads into getting subscriptions for the service. People were simply not getting the signal," he said. Payne said that the city hasn't heard many complaints after the Rio Rancho contract was terminated, "I don't see a huge outcry from the people in Rio Rancho to continue the service." But that may have been in part due to the uneven performance. Van Houwelingen said that the company had 1,600 regular users, although not all were subscribers. Van Houwelingen said, "I don't like the fact that there will definitely be people who will go without service." In Sacramento, the Metro Connect consortium declined to comment on any future role for Azulstar. Wireless Silicon Valley has switched to a pilot that's being built by Cisco and Covad, but a project spokesperson doesn't rule out a future role for Azulstar. One of the big advantages van Houwelingen cites with his firm's approach is that there's little to no political process involved, because the company can proceed without any need for the anchor tenancy and facilities (like poles or buildings) needed for dense Wi-Fi. And he doesn't have to deal with the fallout when elected officials change over. "My big learning from here is what happens in a public-private partnership when the administration changes," he said. So have we all.